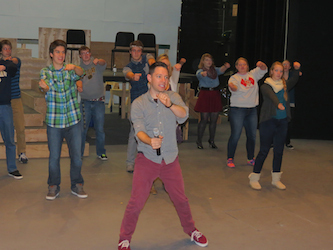 The Prairie School welcomed Broadway performer and novelist Tim Federle to campus on Wednesday, October 22. While talking with the Middle School students he promoted courage rather than confidence, being kind to everyone, being yourself and putting your best foot forward through non-verbal communication. Tim also ran a mock Broadway-audition dance class for one of the Upper School classes where he led exercises about non-verbal communication.